When I was trying to get better I used to swing between good days and (most of the time) bad days. One day I would be doing perfectly fine and the next day I was super depressed and back to where I started. What gives?? 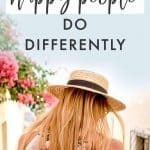 But I realized over time that there were certain things I could change that helped me be happy consistently and eliminated the highs and lows altogether. 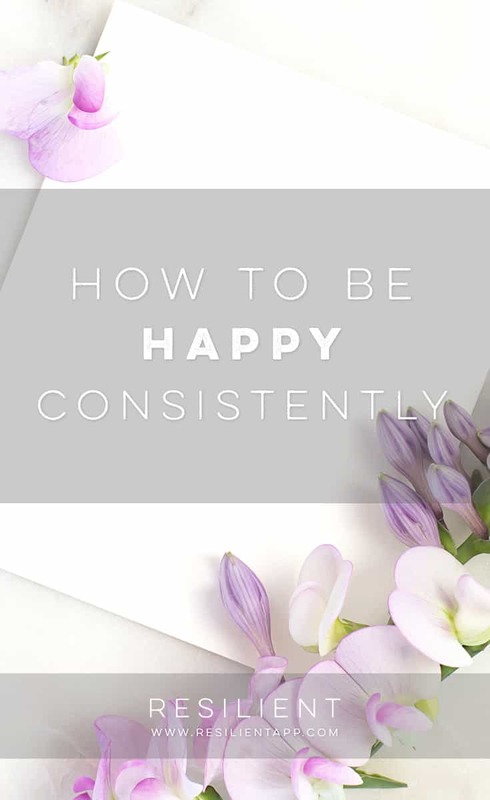 Here’s how to be happy consistently. The basis of this has to do with Gay Hendrick’s idea of “upper limits,” from his book The Big Leap. Here’s what it basically is. We all have internal “thermostats” for how much happiness, success, love, etc that we feel comfortable having in our lives. If we get too far above that level – like a bunch of good things happen suddenly – we kind of start to freak out a little until we get back to our normal, comfortable levels. Whether we’re consciously aware of it or not, usually we start sabotaging things until things get back to what we’re used to. And guess what? It’s very possible that you could self-sabotage and actually make something bad happen because you keep expecting it to. And boom, you’re right back to the upper limit of happiness (or lack of happiness) that you’re used to. So in this way, every time you try to get better, you keep slipping up and falling back into old patterns. But what if you could just turn the dial up a teensy bit on your internal thermostat for happiness? What if you raised it just one degree at a time until you were actually comfortable being a little bit happier all the time? Well, you’d actually be – and stay – happier more consistently. So how do you do that? You get uncomfortable. If you’re trying out different ways to be more positive, more grateful, happier, etc, then at some point you might come across something that makes you feel a little bit better. Or maybe you’re just doing something you love one day – listening to your favorite song, reading your favorite book, watching a funny video, meditating, watching your favorite movie, etc – and you have a moment when you feel genuinely happy. Even for just a tiny moment. I want you to really lean into the feeling of being happy. What does it feel like? How long can you keep holding onto this feeling? What can you do to keep this feeling going just a little bit longer than you normally would? If any negative thoughts come up, passively observe them and let them float away without attaching any meaning to them. It will probably be very uncomfortable to be happy at first if you’ve been unhappy for a long time, but this is the new “normal” level that we’re trying to reach. And it’s very possible to be happy not just on occasion, but consistently and deliberately. Happiness is something you create. But at first, if I tell you to “choose” to be happy, it’s probably a totally foreign concept. Like, “How the heck am I supposed to “choose” to be happy when I’m depressed? 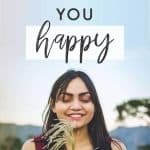 ?” That’s why you need to look out for even just a moment in your week when you feel happy, so you can hold onto the feeling and remember what it’s like to be happy. Go out of your way to spend time doing things you like just so you can actively create this feeling. When you find it, just sit there and hold onto the happy feeling for as long as you can. Breathe into it. And then, if later on you start feeling depressed again or having negative thoughts – let’s call them dementors, like in Harry Potter 😃 – you can remember what it feels like to be happy and pull out your little happy memory – your patronus – and fight back against the depression. Just remember what it felt like to be happy. Let it wash over you. You could even go and do whatever activity made you happy in the first place. Don’t let the dementors win. Every week, and eventually every day, spend time intentionally creating this feeling of being happy. Even if it feels temporary or fake, just go for a little feeling of joy or excitement. If something happens in your regular day to day life that actually makes you happy, then sit with that feeling of happiness for as long as possible too. 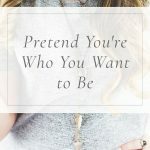 The goal is to train yourself to get comfortable with feeling happy for as long as possible (fake it ’til you make it ;)). 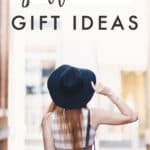 You’re also building up a memory bank of happy moments that you can draw from. 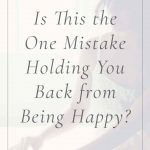 Over time, you’ll gradually become more used to feeling happy and it won’t seem like such a foreign concept. You might even be able to “choose” to be happy in a moment by remembering little happy memories. 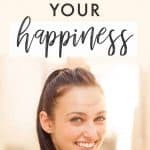 😉 If your internal happiness thermostat goes up a few degrees to a reasonable, content level, then you’re not going to feel comfortable being really depressed one day anymore, so you’ll take the actions necessary to get out of that funk and get back to your happier level. 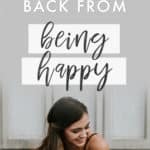 Over time, you can keep raising your happiness “thermostat” until your new normal is actually being happy! 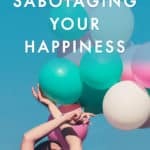 And any time you happen to feel awful, you’ll just feel like something is off and do all your new, positive habits until you get to your new baseline of happiness.